The world inequality crisis is spiralling out of control. Our joint letter to the Guardian, with the Fight Inequality Alliance. As Larry Elliott’s piece pointed out, world elites are meeting at Davos to make global decisions about humanity’s future (All might look rosy, but world’s billionaires are entering avalanche country, 22 January). Their rallying call, “Creating a Shared Future in a Fractured World”, and the content of this 48th World Economic Forum present as a parallel universe for billions of ordinary people. As the WEF takes place, the world faces an inequality crisis that is spiralling out of control. Across it we are seeing the gap between the richest and the rest of us reach unprecedented extremes. Our current economic system works for the elites rather than the people, affecting both our health and wellbeing, as billions live in poverty. Such inequality is also failing and threatening our planet. The Fight Inequality Alliance (FIA) is a growing movement of leading international non-profit organisations, human rights campaigners, equality campaigners, environmental groups, faith-based organisations, trade unions, social movements and civil society organisations that have come together to fight the growing crisis of inequality. We make up a new UK chapter of the FIA. 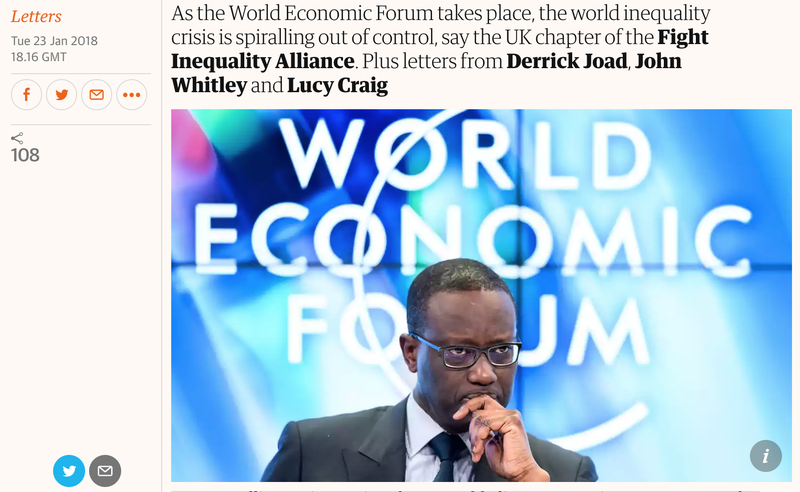 During the our global week of action as the WEF takes place, we are united in asking the government to take action to tackle income inequality, tax transparency, the housing crisis and health inequalities. We believe that not taking decisive action presents a clear and present danger, one that we ignore at our peril. Inequality is not inevitable.